One of the cardinal “rules” of music therapy – with some of the strongest research support – is that people benefit most from the music they prefer. This makes sense – if a client loves country music, a music therapist might try to find songs by Patsy Cline for discussion or use a country-style accompaniment pattern to support improvisation. If someone hates Mozart, it probably isn’t a good start for relaxation exercises. That’s why the music therapy assessment process often includes a question about what kind of music a client likes. A corollary to this rule might be that when a client can’t state a preference, a music therapist should start with the music that was popular when an senior was a young adult (e.g. 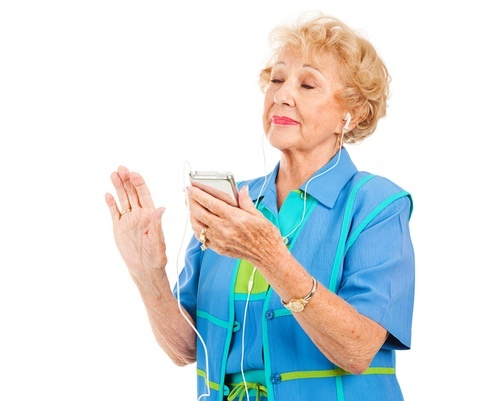 for an 80 year old, choose songs popular in the 1940s and 1950s). Today’s 90-year-old might like “My Blue Heaven” while a 55-year-old might like “Hotel California,” for example. Music therapists also make educated guesses about music preferences based on the information we have about clients’ ethnicities, spiritual backgrounds and personal histories. For example, someone from rural Missouri might be more likely to enjoy country music while someone from urban Kansas City might be more in tune with blues music. The thing is, these “rules” are not hard and fast. People like (and dislike) different songs, musicians, and styles of music for a variety of reasons. For example, my aunt does not like “Amazing Grace.” She grew up in a Christian household where that song was important and loved, but she told me several years ago that if she is ever unable to communicate her own preferences, I had better tell her music therapist not to play “Amazing Grace.” Why not? Because she once had to sit through a very long documentary in which that particular song was played over and over in a variety of styles by a variety of musicians. She had “Amazing Grace” overload. Other hymns, though, would probably be fine with her. On the other hand, my husband probably wouldn’t claim classical music as his favorite genre, but he does like the overture to Rossini’s “Barber of Seville.” Why? Because it’s featured in this Bugs Bunny cartoon. He might not have studied the history of Western music in college or choose the symphony for a night out, but he does know and enjoy this piece. Of course, these two stories only have to do with music preferences based on the associations people have with particular songs or pieces of music. People might also prefer music in a particular mode (e.g. minor keys), with a certain stylistic element (e.g. driving bass line), or with a certain tonal quality (e.g. electronic sounds vs. vocal harmonies vs. orchestra), among other reasons. (Topics for a future post, perhaps?) You never know what particular song or piece of music might engage a client in music therapy. So, what is a music therapist to do? I think we still should start with those educated guesses about what a person might like, staying aware of how clients respond to particular songs or styles. We should also be open to trying different kinds of music while avoiding music that might be offensive to a particular client. What can a caregiver do to help? Be sure to tell your loved one’s music therapist what you know about your loved one’s music preferences. (In fact, I dedicated a post on what to tell your music therapist about your loved one’s musical life. You can read it here.) You should also be open to learning new things about the music that might engage your loved one – it might be different than what you expect! What song/pieces/styles do you enjoy that might seem odd to others? What unexpected music preferences have you encountered in spending time with your loved ones or your clients? Please share your story! My husband and I have had many discussions about music preference and how, as the music therapist, I have to use my educational background and investigatory skills to choose appropriate music. So, ESSENTIALLY, I am picking the music. My spouse often likes to call me a ‘profiler’… of course I prefer to call it ‘music chosen as a result of the patient’s assessment’. He say’s I’m just judging people based on their culture/religion/regional background. I agree with his statement except I wouldn’t call it judging. Well, yeah, I would probably avoid the word “judging,” but I kind of like “profiler.” I think that it is our job as music therapists to structure music experiences to meet client needs, and that means thoroughly assessing music preferences on multiple levels (stated preference, genre, instrumentation, lyric content, tempo, etc.) as well as determining whether something that might not be the client’s *favorite* music might be appropriate anyway. It is not as easy as asking someone what their favorite music is then putting that on a CD player (or having it played live) – that’s why music therapists are necessary. That’s a really difficult explanation to make sometimes, though! Hm…the terminology of “judging” feels pretty harsh! That’s probably just because the word carries such a negative connotation but I like “profiler” as well as “observer”.